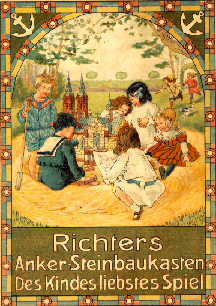 "Des Kindes liebstes Spiel" (The child's favorite toy) -- some variation on this theme was Richter's favorite description of his Anchor Stone Building Sets. In English, Richter usually translated this phrase as "The Toy the Child likes best!" This catalog cover was used in 1912. In fact, Richter's Anchor Stone Building Sets (Richters Anker Steinbaukasten) were the world's most popular construction toy from the early 1880s through W.W.I. These building stones were made in Rudolstadt, Thuringia, Germany, (and at the company's branches in Vienna, New York and, possibly, St. Petersburg, Russia). Starting in 1880, Richter's Anchor building stones were covered by international patents and trademarks. Please note that this home page is under constant revision. The graphics are JPEG, which improves quality and reduces file size. I have used the savings from this graphics format to enlarge some pictures. New graphics, and additional text, are uploaded once a month, as close to the first as possible. So please plan to drop by monthly to see the new pictures. In the restricted (1.4M) space of my home page, I can provide only a limited view of the wonderful world of Richter's Anchor stones. For the month of January, 1997. You are visitor number to the Club of Anchor Friends' home page since the posting date of . From the first appearance of the Anchor home page, August 30, 1996, there has been a steady increase in the number of people accessing it. Over the previous four months there have been about 820 visitors, with more than 255 during December. This revision is the sixth one that has been on the net. (My first effort was temporary and up only four days.) The Date and Time is . I plan to update this site monthly. It was last updated on .